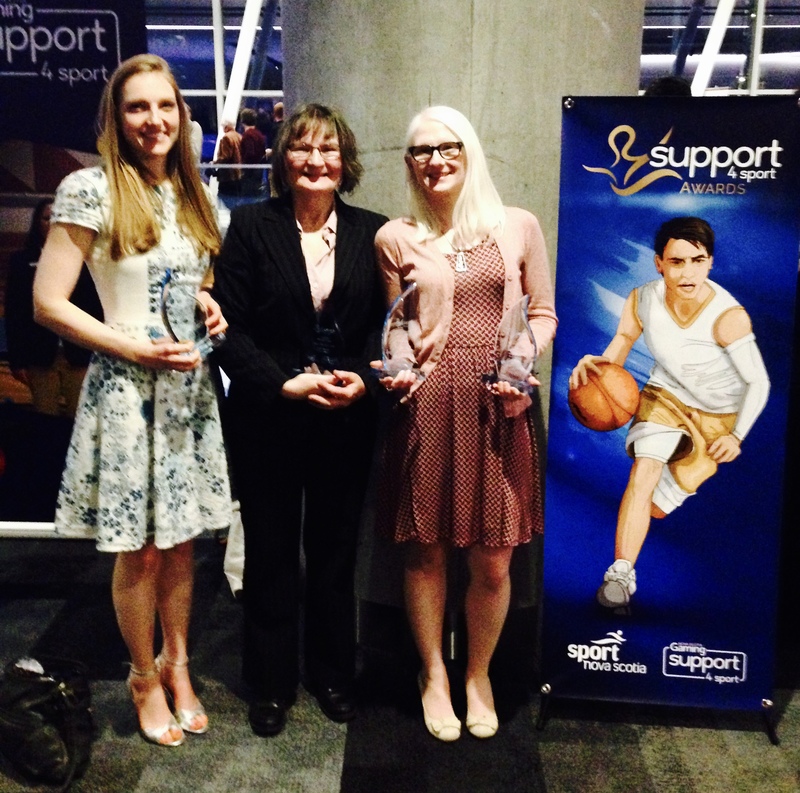 Congratulations to all of the athletes, coaches, volunteers, officials and others whose dedication and passion were recognized at last night’s Support4Sport Awards! Linda dedicates many hours to coaching teams of all ages and abilities who turned in an impressive series of team performances last year. 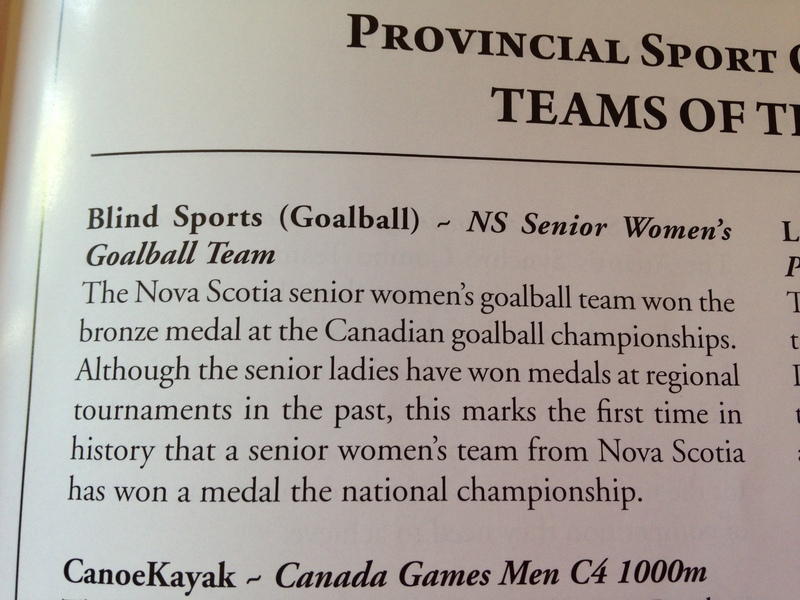 The senior women mande Nova Scotia history by winning their first medal at a Canadian championship – a bronze. The senior men also won bronze. At the junior level, the boys on their second consecutive silver and Nova Scotia’s mixed recreational team won its second consecutive gold at the Eastern Canadian championship. 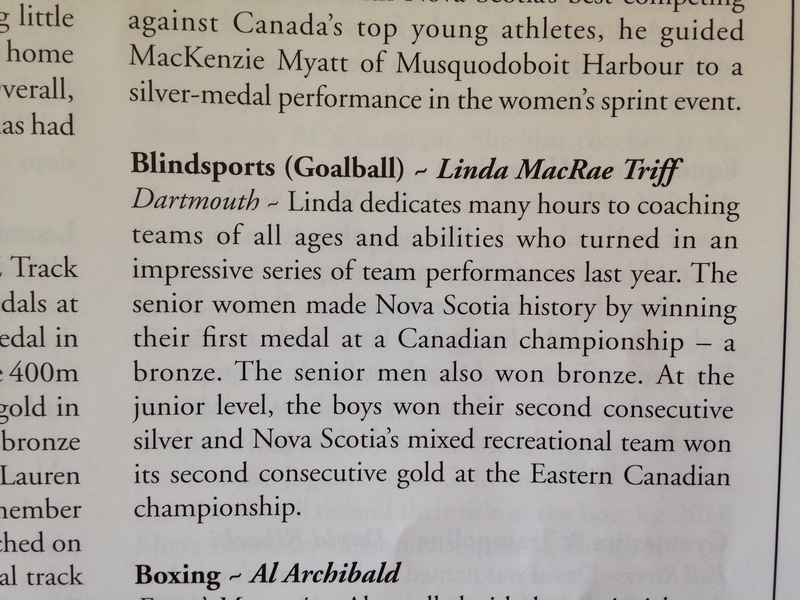 The Nova Scotia senior women’s goalball team won the bronze medal at the Canadian goalball championships. 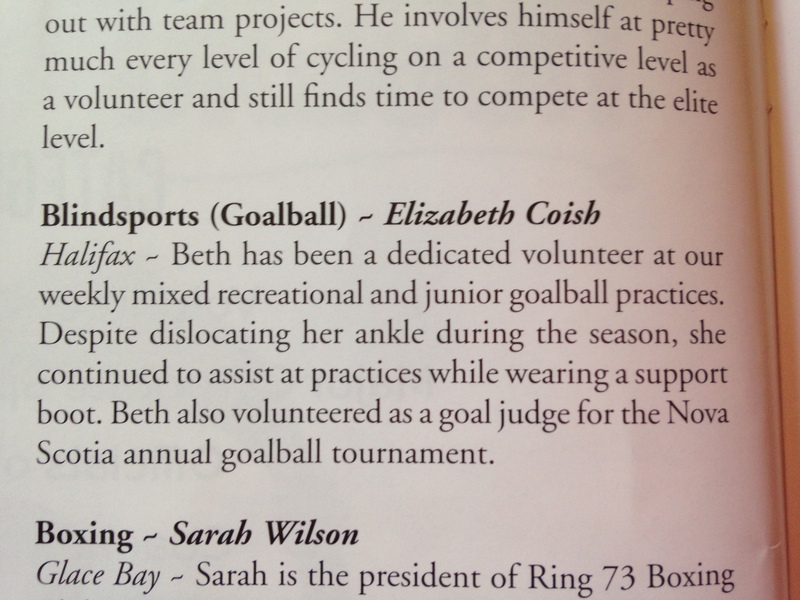 Although the senior ladies have won medals at regional tournaments in the past, this marks the first time in history that a senior women’s team from Nova Scotia has won a medal at the national championship. — with Stephanie Berry, Nancy Morin, Tarah Sawler and Jennie Bovard in Halifax, Nova Scotia. 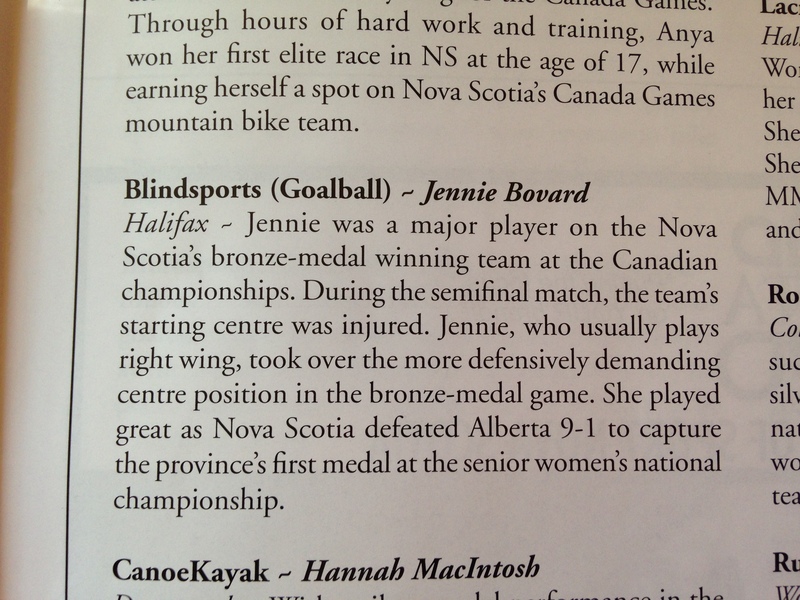 Jennie was a major player on Nova Scotia’s bronze medal winning team at the Canadian championships. During the semi-final match, the team’s starting centre was injured, Jennie, who usually plays right wing, took over the more defensively demanding centre position in the bronze medal game. She played great as Nova Scotia defeated Alberta 9 to 1 to capture the pronvince’s first medalat the senior women’s national championship. 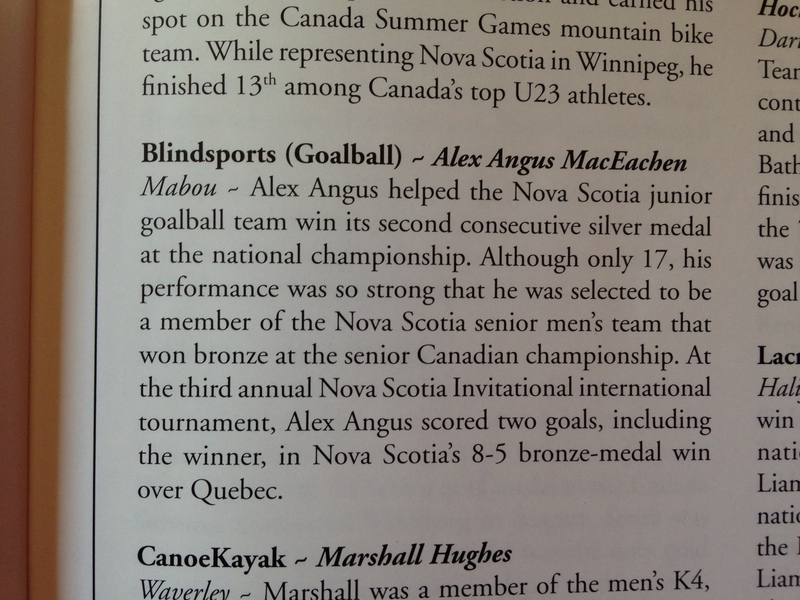 Alex Angus helped the Nova Scotia junior goalball team win its second consecutive silver medal at the national championships. 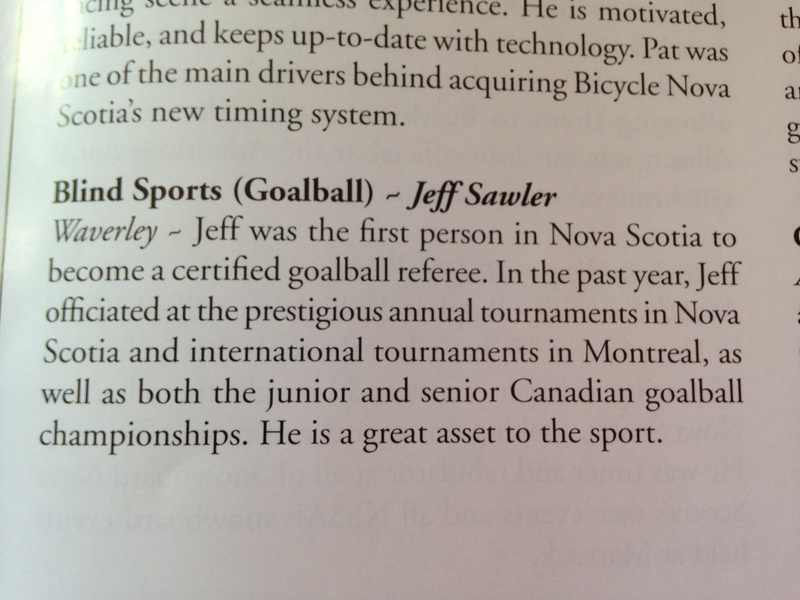 Although only 17, his performance was so strong that he was selected to be a member of the Nova Scotia senior men’s team that won bronze at the senior Canadian championship. At the third annual Nova Scotia Invitational championship, Alec Angus scored two goals, including the winner in Nova Scotia’s 8-5 bronze medal win over Quebec.